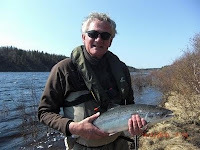 Henry Giles, of Trout and Salmon fame, landed his first Russian salmon and a very decent sea trout before rounding the day off by landing a further one out of the Heli pool just before supper. 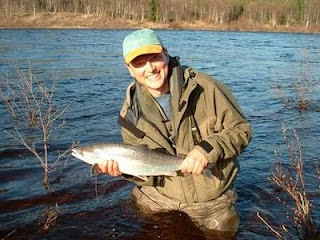 With Alan J also taking 5 cracking fish it has been a great start to the season. It is still hot and the breeze today felt almost tropical but in the past hour the wind has changed and it feels colder now. However, it is all relative and the endless thermals that I lovingly packed are still going unused. Tom Ledger (Kitza camp manager), Paula Erskine (Kitza cook) and I are flying over to Kitza tomorrow to start the setting up of the camp for their first guests who arrive on Saturday. It will be interesting to see how the river looks over there and I will try and take a picture or two for tomorrows update.